A year ago today, I began filming the documentary about Syria, Not Anymore: A Story of Revolution. On my first day of filming I saw a baby without a head brought to Dar al-Shifa Hospital in Aleppo, Syria. I wrote a detailed account of what happened at the hospital that day and posted it on my Facebook page that evening. The documentary film about Syria, Not Anymore: A Story of Revolution, is being shown at over 75 film festivals around the world, has won nearly 20 awards, has been seen by millions on television, and has been the subject of intense media coverage for over a year. With the exception of the ranting and raving of YouTube and Twitter users, the film has not generated much controversy. It is a straightforward and honest film – the story of the Syrian revolution as told through the experiences of two young Syrians, a male rebel fighter and a female journalist. I simply let the two subjects of the film, Nour Kelze and Omar Hattab (Mowya), tell their story without injecting my personal views about the conflict into the film. That Not Anymore: A Story of Revolution would receive the Armin T. Wegner Humanitarian Award was announced in the press on September 13: “The 2013 nominees and Special Awards recipients Matthew Van Dyke and Sev Ohanian truly reflect the festival’s core philosophy, which is to cultivate cultural understanding and global empathy. These are films which shed light on people and places that Los Angeles audiences might only know from the news. 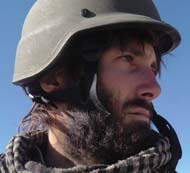 Matthew’s film follows two people on the front lines of the conflict in Syria, while Sev’s film shows the tragic effects of cultural divide here in the United States.” (Sev Ohanian was being awarded the Breakthrough Filmmaker Award for his work as a producer on one of the biggest films of 2013, Fruitvale Station. The Arpa International Film Festival contacted me requesting that I attend the festival to receive the award in person, noting that the recipient of the award has personally received it each year since the inaugural award in 2003. For nearly 2 weeks there was no reaction to the announcement. Then suddenly, just a few days before the awards ceremony on September 29, Arpa International Film Festival director Alex Kalognomos was flooded with phone calls demanding that the Armin T. Wegner Humanitarian Award be withdrawn for Not Anymore: A Story of Revolution. The pro-Assad activists had begun their campaign against the film. The complaints were primarily from Armenian-Americans (Arpa International Film Festival is an Armenian-American event). Some objected to the Armin T. Wegner Humanitarian Award being given to a pro-revolution film because they believed that a humanitarian award, and especially one with Wegner’s legacy attached to it, should not be awarded to a film that takes one side and features two subjects who advocate armed struggle against an oppressor. This was an understandable concern given many people’s limited perspective on what humanitarianism is and means. However, many others openly voiced their support for the regime of Bashar al-Assad. They accused Arpa International Film Festival of giving an award to a film that shows the Syrian revolution in a positive light, when in their view the Syrian revolution will lead to a genocide against the Armenian community in Syria. They argued that the Assad regime had protected Armenians in Syria and that supporting the Assad regime was in the best interest of the Armenian community. Judging by the complaints, most of these people had not seen the film. They accused the film of celebrating Al Qaeda (Al Qaeda is not mentioned in the film, no members of Al Qaeda appear in the film, and the only fighters in the film are part of the Free Syrian Army (FSA) which in recent months has occasionally been fighting against Al Qaeda). After a couple of days of being flooded with phone calls, some of which threatened protests against the festival, Alex Kalognomos informed me that the Arpa International Film Festival had decided to withdraw the Armin T. Wegner Humanitarian Award this year. Alex Kalognomos was very sympathetic and apologetic about the situation. He was also concerned about my welfare during the Q&A session and assured me that it would be conducted in a civil manner but that I could face tough questions. I told him that I made the film in one of the most dangerous places in the world, Aleppo, Syria, so there was nothing I feared in Los Angeles, California. Alex also informed me that Not Anymore: A Story of Revolution would receive a new award, the Silver Lens Award, that would honor courage and bravery in filmmaking. The Arpa International Film Festival Silver Lens Award would be given annually, with Not Anymore: A Story of Revolution being the inaugural recipient of the new award. This was to be a great honor. I was disappointed that the film would not receive the humanitarian award because it would have been a great way to highlight the humanitarian nature of the crisis in Syria. Not Anymore: A Story of Revolution had already won a similar award, the Best Human Rights Short Award (sponsored by Amnesty International) at the Isle of Wight Film Festival in the United Kingdom. However, I recognized that this was a great opportunity for dialogue about the conflict in Syria and to get Americans talking about the Syrian revolution. I contacted several activists and asked them to rally revolution activists to support Not Anymore: A Story of Revolution through phone calls, Tweets, Facebook posts, and emails to Arpa International Film Festival. And they responded with a level of energy and commitment that was inspiring. 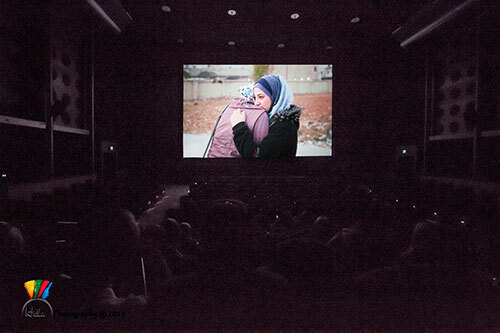 The Syrian American Council (SAC) and the Syrian American Alliance (SAA) sent emails to their members and posted online about the controversy, asking their members to contact Arpa International Film Festival in support of Not Anymore: A Story of Revolution receiving the Armin T. Wegner Humanitarian Award. Alex Kalognomos received many calls in support of Not Anymore: A Story of Revolution, and he really tried hard to discuss the issue with each caller when possible. 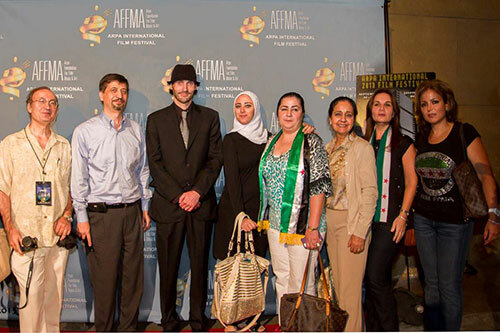 On the night of the screening of the film on September 28, the night before the award’s ceremony on the 29th, Syrian-Americans (mostly from SAC-LA) faced the protestors against the film outside of the famous Grauman’s Egyptian Theatre on Hollywood Boulevard in Los Angeles, California. 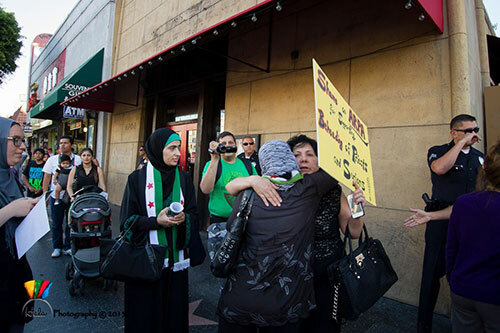 Syria protestors from opposite sides hug outside of the Arpa International Film Festival at Grauman’s Egyptian Theatre in Los Angeles, California. They also saw supporters of the film outnumbering those protesting against it. At the Q&A session after the film I did receive a few tough questions, mostly having to do with Al Qaeda in Syria, which my film had nothing to do with. Director Matthew VanDyke answers questions about his Syria film “Not Anymore: A Story of Revolution” during the Q&A at Arpa International Film Festival. It provided a good opportunity to point out that the Free Syrian Army is the only thing standing between Al Qaeda and the Armenian community in Syria, and that the Free Syrian Army protects Armenians and Christians from both the Assad regime and Al Qaeda. It was also a good opportunity to point out that the Free Syrian Army is fighting for the liberty of everyone in Syria, including Syrian-Armenians. I chose not to prepare a speech for the awards ceremony the following night, deciding instead to speak from the heart given the level of emotions that others had expressed surrounding the giving of a humanitarian award to Not Anymore: A Story of Revolution at the Arpa International Film Festival. I was pleased to see the protestors against the film because it showed that they cared enough about something to get up off their sofa and show up outside Grauman’s Egyptian Theatre to express their opinions. This freedom of expression is part of why the Syrian revolution is being fought, so that Syrians can one day have that freedom as well. I appreciated the dialogue between the pro-revolution and pro-Assad protestors and although I disagree with supporters of the Assad regime I was glad that they expressed their opinions on an issue they are passionate about. I accepted responsibility personally and on behalf of other Syrian revolution activists for failing over the past two years to effectively communicate to the American people who the Syrian rebels are and why they are fighting the Assad regime. The Q&A session after the film had revealed that some Americans believe that the revolution is run by Al Qaeda and even that the Free Syrian Army is synonymous with Al Qaeda. It is not their fault, however, that they believe this but instead our fault for failing with public outreach to inform the American people about the Syrian revolution. I said in the speech that we all needed to do a better job of communicating with the American people and that the controversy surrounding the Armin T. Wegner Humanitarian Award being awarded to Not Anymore: A Story of Revolution had energized me to work even harder on doing so effectively. There are many lessons we can learn from what happened at Arpa International Film Festival this year – that there are many interests involved in the Syrian conflict, that activism in the revolution is alive and well, that Arpa International Film Festival is a professional and well-run event, and that Alex Kalognomos deserves much acclaim for his handling of the controversy. And that Not Anymore: A Story of Revolution sure looks good on a big screen like the one at Grauman’s Egyptian Theatre. However, the most important lesson of all is that the Syrian revolution must refocus its efforts on public outreach. When we have Americans confusing the Free Syrian Army with Al Qaeda, we are facing a serious problem. We will never convince Americans to support the Syrian revolution if they believe that international intervention would be in support of Al Qaeda. We must do a better job of communicating to the American people that the Free Syrian Army is not Al Qaeda, that the Free Syrian Army is the beating heart of this revolution, and that the Free Syrian Army needs our support. I would like to thank all of those who contacted Arpa International Film Festival to voice their support for the film, particularly SAC, SAC-LA, and SAA. 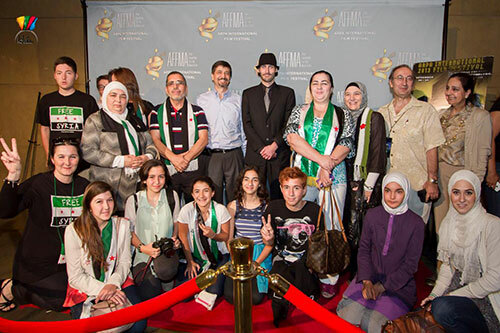 Director Matthew VanDyke with supporters of his documentary film about Syria “Not Anymore: A Story of Revolution” at the Arpa International Film Festival. Matthew VanDyke with supporters at the Arpa International Film Festival. I would also like to thank Arpa International Film Festival for the Silver Lens Award, as well as Arpa founder Sylvia Minassian and Alex Kalognomos for their care and support, and for having one of the best film festivals I have ever been to. Please share this blog post on Facebook, Twitter, Google+, Reddit, etc. Comments on the blog and under the film on YouTube are also much appreciated.